Sure Action probes trigger security cameras, lights, gates, sounders and more! By using Sure Action probes, security and home automation installers can create outdoor vehicle detection systems that enable home owners to have the level of outdoor security they desire. Sure Action Probe Vehicle Detectors monitor the earth's magnetic field. When a vehicle moves through the monitored space, it creates a disturbance in the field and generates a small voltage signal that is sent to a processor. In turn, a relay triggers that drives the resulting action (turn on lights, sound a chime in the home, turn on a video camera, trigger a gate operating system, and more). Our driveway systems are passive, momentary devices that operate as triggers. They are not meant to be used as security devices. They do not responde to stationary metal. The vehicles must be moving to be detected. If the movement stops, the probes response becomes passive (inert) again. Sure Action's probes (driveway sensors) can detect a vehicle moving as slow as 1/2-mile per hour and work for driveways as wide as 14-feet. Sure Action's Directional Probe enables installers to set up different responses depending on the direction a vehicle is travelling. For example, the probe may trigger lights and a chime when a vehicle enters the driveway, but only trigger the lights when the vehicle departs. Another example, directional probes can be used on long driveways to trigger lights sequentially so that only one section is illuminated at a time as the car enters and leaves. Probe and processor can be up to 1,000 feet apart. 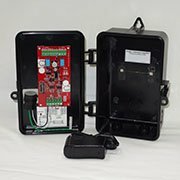 Optional Parts: Timed Relay (TM60), Photocell (ON/OFF), CHIMEPLT (Wired chime mounted on while plate with an on/off switch), RXTX612 (Wireless Chime Transmitter (runs off 12VDC) and Wireless Chime Receiver (plugs into wall outlet). Sure Action's Battery-Operated Probes are a "must have" for installations where trenching is difficult or where the application is in a remote location. Now in the 5th generation! While individual components are available for purchase and the processor can be paired with any transmitter, Sure Action has partnered with Innovonics, one of the leading names in wireless, to provide installers with a complete battery-operated driveway probe option. System responds only to moving ferrous metal. Complete system includes a NEMA III enclosure that houses the transmitter, processor (conformal coated) and batteries. The driveway sensor (probe) has a standard 25-foot lead. A receiver, sounder, and power supply are supplied for inside a building. The tranmitter and receiver are pre-programmed. The NEMA III box should be mounted on a wooden post and should be as concealed as possible. The transmitter included with the system is tested to 2,000 feet in open air (Line of sight at four feet above ground level). The system includes lithium batteries enabling it to be used in all climates. WP5CDE - Complete Battery-Operated Probe System, Dual Entrance (2,500 feet, tested to 2,000 feet) - (2) WP5 processors, (2) Inovonics transmitters, (1) Inovonics receiver, (2) N3BOX, (2) P500 probes with 25-feet 22/2 shielded burial cable, (4) 9VBL, (1) 12VDC1, and (1) RXTX6 Wireless Chime (Wired Chime option available) [Systems tested to 2,000 feet]. 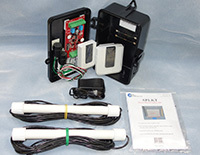 WP5CDELR - Complete Battery-Operated Probe System, Dual Entrance - Long Range (10,000 feet, tested 4,000 feet) - (2) WP5 processors, (2) Inovonics long-range transmitters, (1) Inovonics receiver, (2) N3BOX, (2) P500 probes with 25-feet 22/2 shielded burial cable, (4) 9VBL, (1) 12VDC1, and (1) RXTX6 Wireless Chime (Wired Chime option available) [Systems tested to 2,000 feet]. WP5B - Basic Battery-Operated Probe Package - WP5 processor, P500 probe with 25-feet 22/2 shielded burial cable, N3BOX, and (2) 9VBL. Chime and wireless equipment sold separately. Sure Action's Basic Probes are ideal for the installer who prefers pre-cut wire lengths. 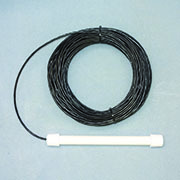 Driveway sensor comes with your choice of wire lengths: 50', 125', 250', 500' or 1000'. Wire is 22/2 shielded burial cable. Variety of wire lengths from which to choose. Chime, other sounder or lighting controls.